A super rare pedal from the UK from 75-77. When they come up for sale they go for stupid amounts of money, >$700. The only information I could find about it. This interesting pedal is Top Gear’s most dynamic, and combines both their Fuzz and Treble Boost circuitry into one versatile effect. Even though the pedal is capable of producing an incredibly large palette from which to choose, it is quite accessible, and sounds really good with any combination of control settings. 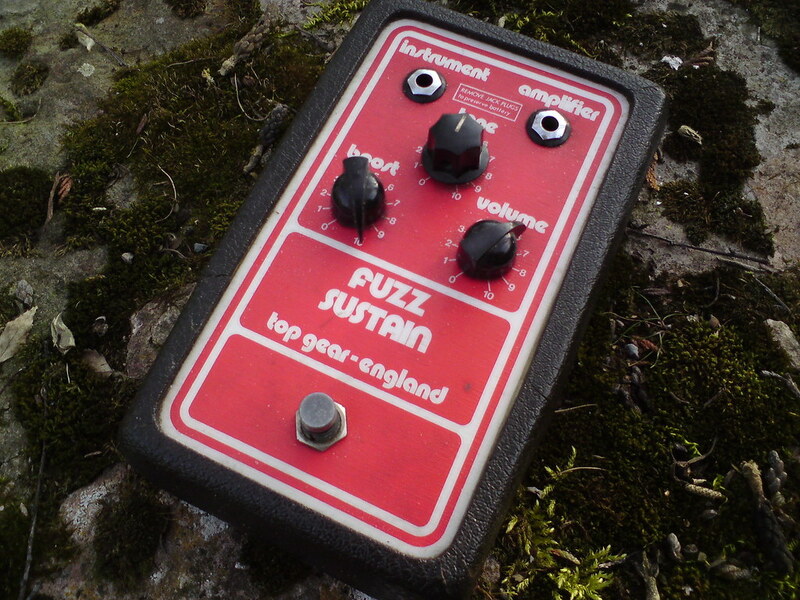 Earlier Top Gear pedals are likened to concurrent better known fuzz pedals, and often draw inspiration from such simple circuitry, however, this circuit is completely unique to the Fuzz Sustain, and while it is similar to other late-’70s Colorsound and Eurotec models, there are significant differences. UK-made Top Gear pedals are inherently rare, and rarely are they available. There was a request to trace it and create a layout. The bottom leg of the top right 10n cap isn't connected to anything. ugh. it's one of those days. fixed the layout. the layout got 1 column larger, but as a plus the wiring got neater. Still not a go; I get really low output and the boost knob is not well. Volume and tone are functioning correctly but Boost is less dirty as you turn up (even after switching wires). Is the ground of the 10u cap from the diodes supposed to connect to boost 1 or ground? Swap around the top left 4.7K with the 3.9M. i made the resistor change in the layout. Is there a Link to a schematic? Built this tonight. Very nearly verified: I think the boost connections are the wrong way round: the wire labelled "boost 1" should go to lug 3 on the pot, and the one labelled "boost 2 & 3" goes to lugs 1 & 2. That makes the boost pot so it increases distortion when turned clockwise. Apart from this it's working nicely.Nice one, Zach, thankyou. My bad. I labelled the lugs wrong on the schematic. Cheers lads. Sweet. I'll make the corrections and mark it verified when I get home. You just beat me to it! Double-verified, I guess? I had the same experience with the boost pot. Once I got it working the only thing was that with boost all the way up I got a shrill tone. Used TL071 as a sub, maybe the original sounds better?